3d models are essential in modern jewelry design. A CAD model, or “Computed-Aided Design”, is a 3d digital model of an object. In the jewelry industry, CAD models are used to design jewelry of any shape or material. In addition to being a central part of the modern jewelry production process, CAD files are also used in many other industries, including architecture and engineering. Why are CAD files important for jewelry design? Simply put, a CAD file is used to 3d print a wax model, which is then cast into a precious metal. The 3d printing process is a lot more efficient than designing and making a wax model by hand, so the jewelry industry has started to embrace this new technology over the past decade. What are some benefits of working with CAD programs? 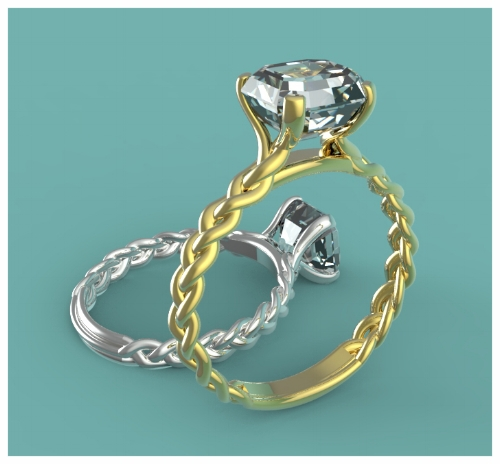 One of the main benefits of working with a CAD file is that the 3d designer can see what the finished jewelry will look like early on in the process. This can help anticipate any potential design flaws and allows the designer to make sure the model is fit for production. What might have taken a day to draw by hand and measure can be designed in hours using a CAD program. Aside from making life easier for the jewelry studio, a digital model allows the client to make sure they like the design before it’s actually produced. They can also work directly with the 3d designer to make any desired changes. This improves the communication process between the jeweler and the client and helps to ensure both parties are satisfied with the design. Finally, a CAD model allows the jeweler to estimate the metal weight beforehand; as a result, the client can have a price estimate before even commiting to production. Are there any common issues that come up when working with CAD files? Although CAD files can be a great asset in the hands of skilled 3d designers, there are some issues that may arise with inexperienced jewelry professionals. It’s important that CAD designers have at least a year of on-the-bench jewelry manufacturing experience. Otherwise, they may not be able to fully translate their design ideas into practical application when working with 3d software. It’s common that designers without hands on experience often make crucial design errors when developing digital CAD models, so it’s important to learn the basics of jewelry production first. How do you start working with a CAD designer? If you’re looking to develop your jewelry designs but don’t want to invest energy and resources into learning modeling software, you can work with a 3d designer or jewelry studio that specializes in making digital jewelry designs. They can guide you through the process and make sure your design is just how you imagined it. Simply send a sketch or idea to the studio and they’ll develop the initial 3d model, which they can then refine further with your input. Since you’ll be working closely with your digital designer, make sure you get along and can communicate easily. Should you learn 3D modeling software? If you’d rather learn how to 3d design your own jewelry, you’ll need to invest in some online or college courses, as well as high-quality digital modeling software like Rhino. Be aware that you won’t become an expert in CAD design overnight, or even after a few months. If you want to make sure your jewelry models are functional and practical, you’ll also need to have on-the-bench experience. If you’re serious about having full control over your jewelry production, you’ll likely have to take an apprenticeship or training to develop your handcrafting skills. Of course, for most up-and-coming designers, working with a 3d designer and jewelry production studio to craft their jewelry is the fastest and most efficient way to develop their collection. A good studio will always work hand-in-hand with an up-and-coming designer to make sure their jewelry is designed exactly as they envisioned. For more info on how to become a jewelry designer without prior experience, see our blog here.